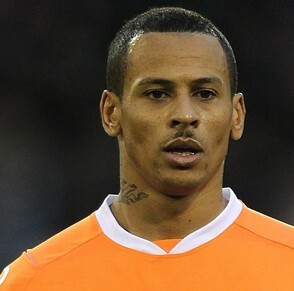 Aston Villa are emerging as the favourites to land Blackpool's DJ Campbell for a cut-price £1.25million. Alex McLeish has been handed a transfer kitty of £35m and is ready to compete with Sunderland for Manchester United defender Wes Brown as well as fighting Liverpool for Blackpool playmaker Charlie Adam. But the new Villa boss has identified a few cheaper targets, including striker Campbell.Campbell started his career at Aston Villa as a trainee, but was not offered a professional contract. The 29 year old has told Blackpool manager Ian Holloway that he wants to leave the club this summer should a Premier League club bid for him, and it has been rumoured that DJ has a release clause in his contract that would let him leave Bloomfield Road for less than £2 million.The player had previously been linked with a move to Fulham, but this has been denied by the London club, with a source close to Martin Jol allegedly saying that the Dutch manager was 'embarrassed' to be linked with DJ.